The world of internet is growing day by day, thus creating many online job and business opportunities. If you wish to earn money (or experience) then you should definitely try online freelance jobs as they are an awesome way of earning some bucks. They have many advantages, for example, you get to work from home and have a choice to work either part-time or full-time. Depending upon your expertise you also have many types of jobs to choose from, such as, content writing, graphic designing, programming or being a virtual assistant etc. These jobs allow showcasing your talents and also meliorating your skills. You also learn a lot from such jobs and get professional experience which can prove to be helpful for you in your career. So now the big question: Where to find these online freelance jobs? Well, in order to help you out today we have a list of 25 Great Freelance Jobs Websites which can help you begin your freelancing career. 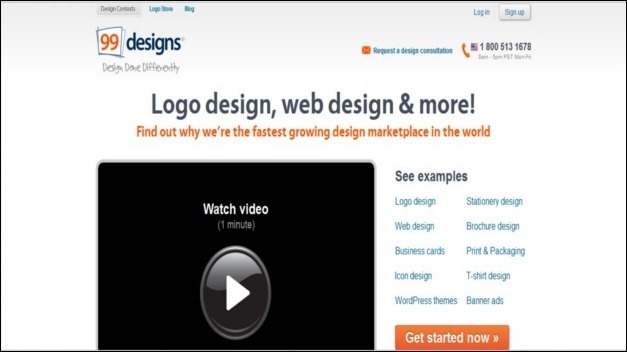 If you Like This Article, You Might be interested on Help Designers Make Money, Entrepreneur Business Websites, Online Business Opportunities, Finding A Graphic Design Jobs and 10 Tips For Freelancer to Work Again. On this website graphic artists, writers and programmers can bid for projects and then earn bucks after completing the project. Many jobs are posted on Get A Coder everyday and you can then start bidding for the projects in whatever category you like. Here you can find jobs according to your wish and talent. Freelance required you to get registered first. After that you have the ability of viewing available jobs. It boasts many different types of jobs such as data entry, content writing and web designing etc. Many projects are posted on Project Spring everyday. 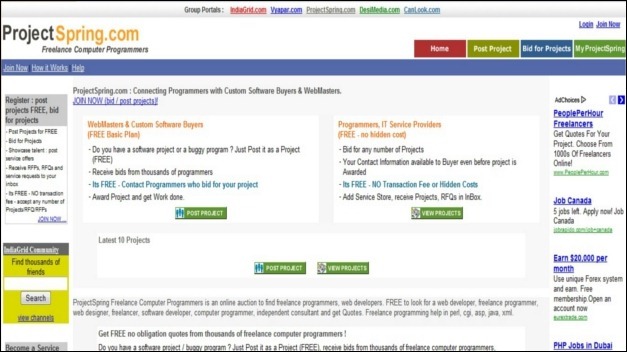 Programmers and web designers have the ability of bidding for different projects at a time. 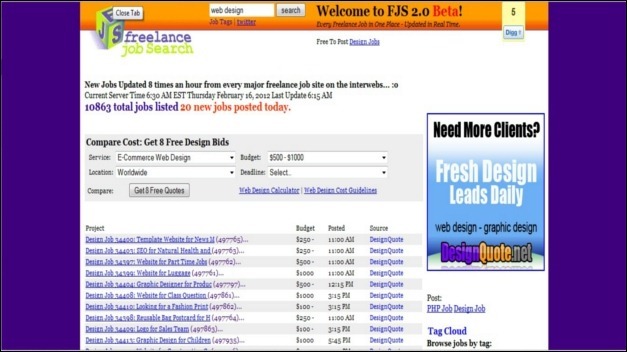 Freelancers such as a content writer, logo designer and web programmer can find many jobs on this website. Other types of jobs are also available. All Freelance Work allows you and your clients have a great working relationship. 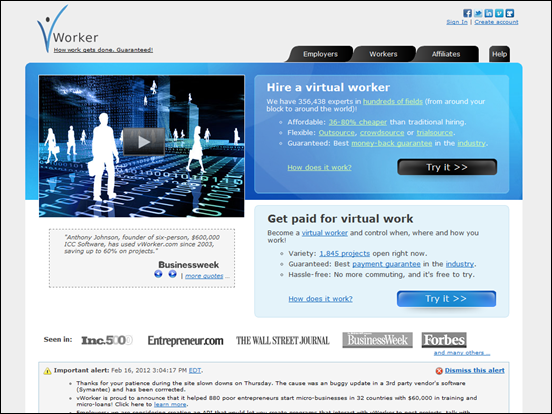 It boasts many freelance jobs of various types. Freelance India is not really famous but it has many different types of freelance jobs for your skills. You have the choice to either work full-time or part-time. Programmer Meet Designer is an online portal where web programmers and designers can build a great working relationship. Content writers and web entrepreneurs can also register here. Web programmer or engineer? If so, then Authentic Jobs is the perfect place for you. Here full-time or part-time freelance jobs are available. 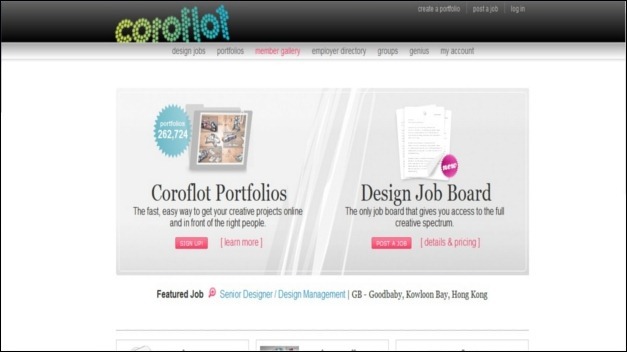 Coroflot is a great portal for professionals and clients, where you can find portfolio tips and career advice. Krop is a job board where you can find many from various popular companies from around the world. If you have the talent of creating logos, banners, and other web designs then this is the perfect place for you to look for a job. On this website many individuals and companies come looking for employees. On Freelancer you can bid for projects such as writing or web design etc. You can earn $30 per project by working with different clients from around the world. A great place for programmers, content writers, and web designers! 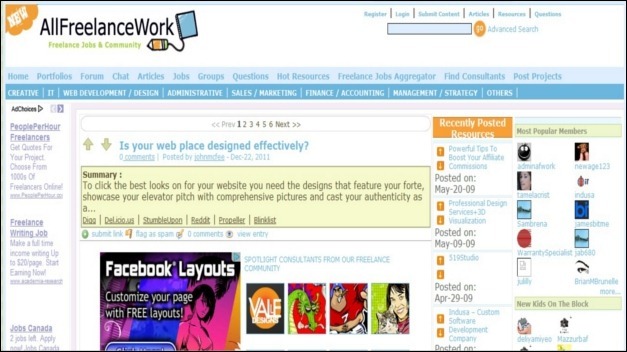 People Per Hour was launched in 2008 which has since then become a great platform for small enterprises and freelancers. Bidding for various projects by content writers, programmers, virtual assistants, and graphic artists is possible. 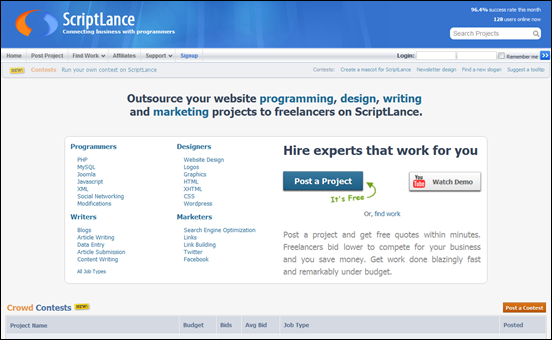 Programmers, web designers, content writers, virtual assistants, marketing professionals etc can find freelancing jobs on this website. The better reputation you have, the more work you get. Simple. 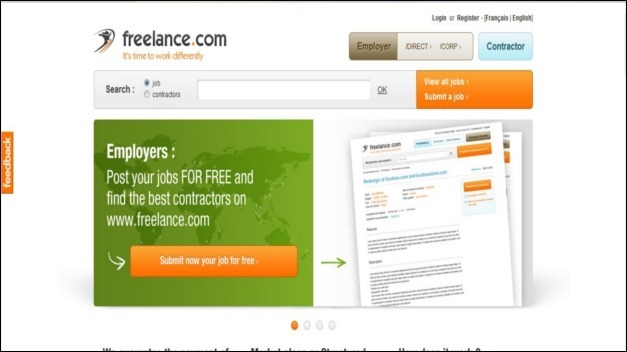 Freelanza is a job board for freelancers. You can find projects on this site and also view freelancing blogs and news. As the name suggests, Project 4 Hire has many job offers in various categories. 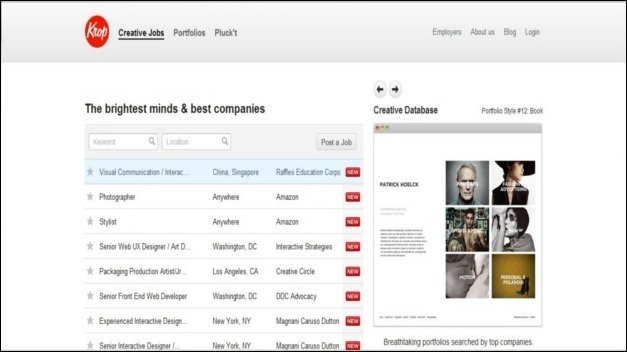 Eeb designers, content writers, engineers, etc can find many jobs on this website. Now a days a lot of companies and businesses wish to get their logo designed by artists. If you have the talent of creating logos then you should definitely check this website out, as many jobs are available here. 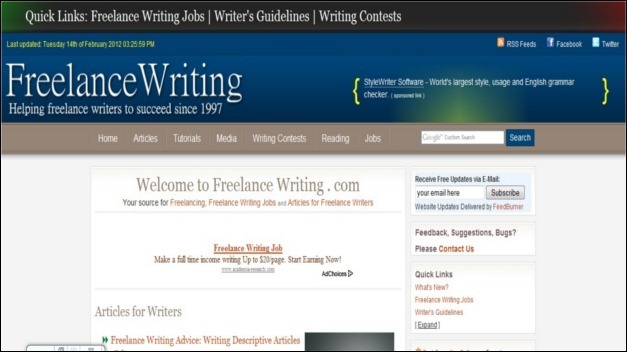 This website boasts freelance writing jobs. If you can write quality articles then check this site out as it has many job opportunities. It also has many tips on ameliorating your writing skills. If you are a programmer or web designer who knows various programming languages then Scriptlance is the place for you. Many projects are posted here, and content writers can bid for their type of projects. This website requires you to register, which is free. And then you can begin earning online. You also have the ability posting your resume here and then clients can review them. Translator Café is an online job directory for people who are looking for typing jobs, medical translation jobs, and various other types of work-from-home jobs. 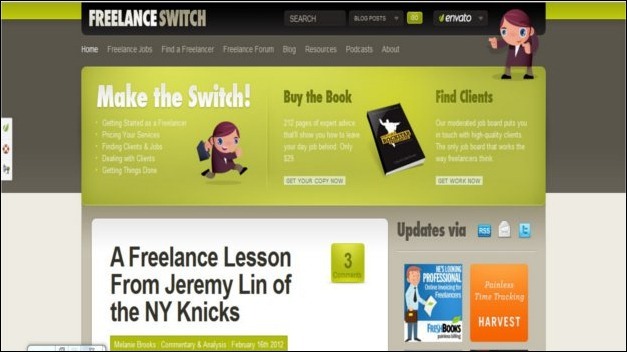 Freelance Switch is a website where freelancers and clients can have a great working relationship. You can choose to work for certain projects and then earn money after completing them. Sologig is an online portal where you can find IT and engineering related jobs. On this website many different types of jobs are present such as data entry jobs, content writing, web programming, social media jobs, proofreading, and various other freelance jobs. OMG !! The Biggest Freelance Marketplace ELANCE is not is the List ? ?